Get out of the classroom and out on the Water with the RentalBoat.com acclaimed hands-on Boating Course. Because the best way to operate a boat is AT THE HELM and not at your desk. Are you new to boating? Are you looking to buy a boat and want to ensure that your spouse or kids can safely operate your new vessel? Here at RentalBoat.com we offer the most comprehensive South Florida boating course that is tailored to you so that you can get out on the water and handle a boat like a seasoned captain. Our United States Coast Guard-certified captains will “show you the ropes” so that you may operate your boat safely with your family and friends. At RentalBoat.com, we support United States Coast Guard’s mission to minimize loss of life, injury, vessel damage and environmental impact associated with the use of recreational/pleasure boats while providing for an enjoyable maritime experience. 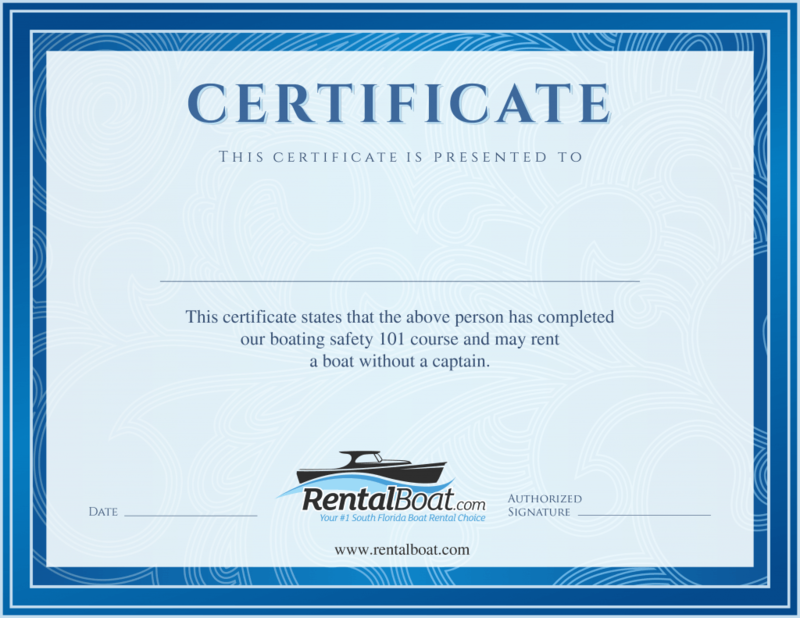 Also, when renting a boat from us, you will not require one of our captains – you can take your vessel out on your own! Our “Boating Instruction 101” course is our entry-level course that consist of 3 hours of hands-on instruction at the helm of one of our vessels, under the guidance or our U.S. Coast Guard-approved captain. You will learn to operate our boats here at the marina on the water, not in a classroom. At the end of your 3-hour session, you will have the confidence and skills to safely pilot and maneuver one of our boats – on your own. Your family and friends will think you have been boating for years. Trust us! Has it been a few years since you’ve been at the throttles? No problem, Our Boating Instruction 101 is the perfect refresher course to help you remember the ins and outs of safe, enjoyable boating. Are you an experienced boater who is looking to take your skills to the next level? We offer advanced classes such as multi-engine operation, nighttime operation/navigation and boat trailering/launching/recovery. Our instructors are also available to conduct the lessons aboard your own vessel (up to 100 feet in length, certain restrictions apply). Boat Docking including tying up, using fenders. Ask about our advanced courses and our Special Offers. Enjoy Labor Day on the Water with Us!